Tech Sgt. MaCherie Dunbar was deployed twice to Iraq in 2007-2008. 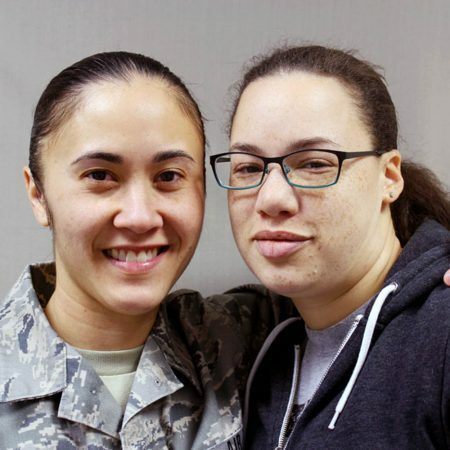 At StoryCorps, MaCherie told her then-girlfriend, Barb Maglaqui, about one of the hardest things she had to do while overseas. MaCherie retired from the Air Force in 2014 and went on to earn her BA in Communications from the University of Alaska Fairbanks. Public about her own struggle with combat-related Post-Traumatic-Stress Disorder (PTSD), MaCherie has become a fierce advocate for veterans, especially around issues of healthcare. Produced by StoryCorps. Originally aired May 23, 2014, on NPR’s Morning Edition.